2. Students will create hyperlinks for their navigation bar. 2. Save your image 4 times (1 for each page!) - Use the Save for Web and Devices Function. #2. Next turn on your BIO folder and hide the INDEX folder. Save for Web and Devices as "bio" and choose "IMAGES ONLY"
3. Create a NEW LOCAL WEBSITE. #2. Go to File > Close Site (or File > Close, if Close site isn't available) to make sure you're not editing someone else's website. #3. Go to File > New. On the Wizard box on your right choose "One Page Website"
#4. In the space that says "SPECIFY THE NEW LOCATION FOR THE NEW WEBSITE" click BROWSE. Navigate to the folder My Documents > My Websites and type your name P5-First-Last and click Open. #5. Navigate to the folder with your WEBSITE.HTML file and open it up. 6. In your Folders Panel on the Left, Create a new folder called "SLIDESHOW"
Copy all your favorite design files into that folder (Copy - Paste). Below are the winners (one of these winners will be our GOBO). Choose 1 and create a 6"x4" poster (or 4x6) with 300 DPI. A tagline like "Think you got talent?" 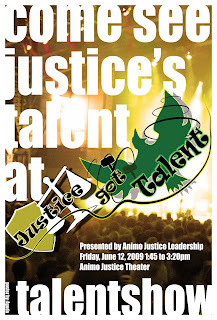 or "Where's the Justice Talent?" In small letters on the bottom of the poster, give yourself credit, "Poster by: Your Name"